Hey there! 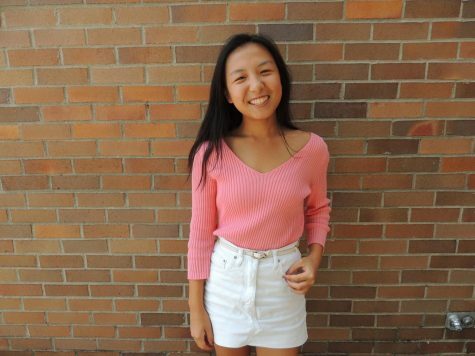 My name is Grace Zhang and I am currently a sophomore at SHS. This is my first year on staff so I am very excited for a fabulous year to come. I currently hold the position of a staff writer and a copy editor; essentially, I write for the newspaper and online platform as well as making sure writers are adhering to the AP style. Okay, as for a little bit about me. At SHS, I love being involved! Athletic-wise, I am a varsity golfer as well as captain of our dance team, the Flyerettes. Additionally, I am a lead mentor in fast track, one of my favorite programs where students help students, whether it be in organization, academics or just everyday life. My two equal loves here at SHS are the fashion program and the law extracurriculars. So enough about what I do. Maybe you would like to know some of the why’s? As I mentioned, a huge part of me is my absolute love for law. I am so thankful I was able to experience mock trial and moot court last year to truly affirm my desire for a profession in law. I always find a thrill when I assume the position of a lawyer; to critically analyze every aspect of an argument, especially knowing that rarely will it be black and white, not only is so exciting, but I probably consider it my favorite part about the law. Plus, the idea that there will always be two (or more) sides to anything reminds me how in journalism too, there will always be multiple perspectives as long as you have the facts to back you up. Now, let’s take a complete 360 to a different side of me, which is my love and passion for fashion. This often comes as a surprise to most since it really is quite different from my other passions but if you have not noticed yet, surprising people is something I really enjoy doing. Anyways, I have always been inspired by classic designers and I have recently found a happy place in fashion journalism for I enjoy using style as a way of expression; so with joining journalism, I hope to get my style voice out there, as well as learning more about the intricacies in fashion journalism. Plus, I have always looked up to fashion bloggers and if there’s any place to explore this dream, I would believe it would be here, in room 115. “Just be true to yourself, and listen as much as one is able to other people whose opinions you respect and look up to but in the end it has to come from you. It has to be a true vision.” -Anna Wintour, editor-in-chief of Vogue. So with that, happy reading!